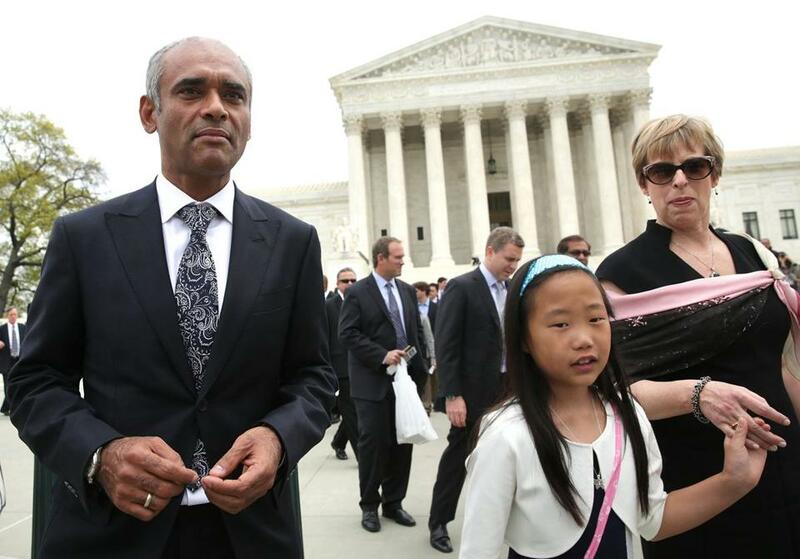 Aereo CEO Chet Kanojia (left) left the US Supreme Court after oral arguments. WASHINGTON — Aereo, a streaming video company built in Boston that could transform the way Americans watch network television, faced tough, skeptical questions from several Supreme Court justices Tuesday about its fledgling business. If Aereo withstands copyright law challenges from the traditional TV networks, it would threaten the hold that big broadcasters have on network television. The startup company captures free broadcast television signals and then sells them to consumers over the Internet. But the broadcasters see the service as nothing more than theft, and the comments and questions from justices indicated that Aereo may have a difficult time convincing the court that its business conforms to the law. “It looks as if somehow you are escaping a constraint that’s imposed upon [other companies]. That’s what disturbs everyone,” said Justice Stephen Breyer, referring to the billions in fees that cable and satellite companies pay for the right to retransmit network TV shows. “You are the only player so far that doesn’t pay any royalties at any stage,” said Justice Ruth Bader Ginsburg. Broadcasters maintain in their Supreme Court challenge that Aereo, a two-year-old company with its engineering operations in Boston, is illegally hijacking broadcast signals to resell copyrighted content. Aereo contends it is simply providing the equivalent of an antenna-like service for individual consumers. The case illustrates how technology is outpacing a decades-old federal copyright law written before Internet retransmission was possible, and raises the question of when broadening consumer access to free television programming amounts to Internet piracy. Aereo’s service is available in 11 cities, including Boston, where consumers pay $8 to $12 a month to watch live television over the Internet — on their computers or mobile devices — or have the company store the shows on its remote servers to be played back later. The service has been barred in half a dozen Western states, including Utah and Colorado. Aereo’s headquarters are in New York, but its engineering office is in Boston near the Fort Point Channel, where 80 employees are based. Backed in part by a Cambridge venture capital firm, Highland Capital Partners, the company has raised $97 million from investors thus far. Thousands of tiny antennas are located in Aereo’s multiple data centers around the country, and the content is streamed over the Internet. On Tuesday, the justices voiced concern over how the court’s decision would affect future digital innovation. They appeared inclined to tread carefully, so as not to harm other companies that store users’ personal music collection, photographs, and another information in a remote online network, or a so-called “cloud,” like what Aereo uses. Several justices grilled the attorney representing Aereo, asking him to justify how the company’s services could possibly be legal when its competitors must pay fees, but also conveyed a sort of grudging admiration. “All I’m trying to get at, and I’m not saying it’s outcome determinative or necessarily bad, I’m just saying your technological model is based solely on circumventing legal prohibitions that you don’t want to comply with, which is fine. I mean, that’s — you know, lawyers do that,” said Chief Justice John Roberts. Broadcasters, including ABC, NBC, CBS, Fox, and PBS, are accusing Aereo of blatant theft for competing against cable and satellite television without paying retransmission fees. The Obama administration has sided with the broadcasters. Aereo says its method of assigning each customer an individual dime-sized antenna to access over-the-air networks — much like traditional rabbit ear antennas — makes their service comparable to customers using antennas in their own homes. The justices — on both ends of the political spectrum — did not seem to buy the company’s argument, casting the array of antennas as clever tools for circumventing copyright laws. Justices Antonin Scalia, Ginsburg, and Roberts questioned whether Aereo’s tens of thousands of antennas served a technical purpose. “There’s no technological reason for you to have 10,000 dime-sized antennas, other than to get around the copyright laws,” Roberts said. David Frederick, Aereo’s attorney, said it made financial sense for a fledgling company to use that technology because it saves money by adding antennas as the number of customers grows and avoiding permit hassles associated with erecting large antennas atop buildings. “The justices hammering at this, to me, seems to indicate that they are viewing Aereo as — I hesitate to say a bad actor, because they are clearly an innovative company — but it seems that the justices were leaning against them,” said Anderson Duff, a trademark and copyright attorney at Wolf Greenfield in Boston. The crux of the case will be whether the court determines if Aereo is engaging in a private service or a “public performance,” an exclusive right belonging to a copyright holder as covered by the 1976 Copyright Act. If the court rules against Aereo, Frederick said, there would be implications for other industries that no one can predict, which would have a chilling effect on innovation. “And that’s why the cloud computing industry is freaked out about this case,” he said. Furthermore, Frederick made a distinction between video-on-demand services and what Aereo provides, saying that no recording made by a customer is ever accessible to anyone else because it’s a distinct copy — and thus, a private performance. “But that’s the reason we call them copies, because they’re the same,” Roberts said, as the packed courtroom erupted in laughter. In a 1984 decision on Sony’s Betamax video recorder, the court ruled that consumers could legally record television programming for personal use. A lower court ruling in 2008 allowed Cablevision to store consumers’ DVR recordings remotely. Unlike Aereo, however, Cablevision had already paid licensing fees for the content it was storing — a point attorneys for the federal government and the broadcast companies emphasized. At the end of the hourlong arguments, Justice Sonia Sotomayor asked about the consequences of the court’s decision — whether Aereo would be put out of business or be forced to negotiate licensing fees. A decision is expected in June. In a press conference outside the courthouse following the arguments, Frederick said he remained “cautiously optimistic” that Aereo would prevail.